It’s a scenario Brian Causey faces often this time of year. Customers walk into the Cherry Hill, N.J., Best Buy where he works and want to buy an iPhone as a holiday gift. They want it to be a surprise. And they want the phone to work right after it’s unwrapped—or at least, they want it working as quickly as possible. Do you already share a wireless phone “family” account with the gift-getter? If the answer is yes, giving the gift of an iPhone will go much more smoothly. With the exception of getting an unlocked iPhone—an option we’ll touch on below—buying one of Apple’s smartphones involves a two-year contract. You can legally agree to one for another person only if you share the wireless contract. “If you’re all on the same account and you’re an authorized user, anybody that’s an authorized user can come in and do a standard upgrade,” Causey said. If that’s the case and the gift-recipient is eligible for a smartphone upgrade, you can apply that eligibility to your purchase. If you’re eligible for an upgrade, you can apply that to the gift. Things get trickier if you don’t share a wireless account with the recipient of your generous gift. But you’ve still got several options. If the recipient is a member of your family, you can add a line to your wireless account. But the wireless companies advise caution on that front. “Just remember that the service you set up will be in your name and you’ll be responsible for the account,” AT&T says on its phone-giving advice page. The other option is to go ahead and create a brand-new wireless account and sign the two-year contract for a brand-new phone, with the expectation the recipient will take over the account after Christmas. That lets recipients open the box with an active phone; if they want they can port their existing phone number to the account later. AT&T, Verizon Wireless, and Sprint all have procedures for transferring accounts and porting numbers. If jumping through the contractual hoops seems too complicated, you can always give up and give your loved one an iPhone gift card from Apple. You can give the card in any amount, starting at $25; on the order page, Apple helpfully supplies the prices for its assorted iPhone 4S and 4 models. Recipients can use the card to pay for their phone; they’re responsible for picking up the phone and handling the administrative tasks. You can also opt for an unlocked iPhone that comes without any contracts or commitments. But you’ll have to pay up for the privilege. An unlocked 8GB iPhone 4 will set you back $600. 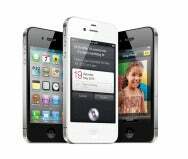 An unlocked iPhone 4S is even more expensive, ranging in price for $649 to $849, depending on capacity. If you opt for a phone with a contract, note that there are some differences between the carriers. Recipients of an AT&T phone will have to activate its SIM card—something they can do online, or by taking their phone into an AT&T store. Sprint and Verizon phones can be activated over the air. With the latter phones, though, there can be a problem: If the new iPhone is an upgrade for the recipient’s phone number, activating the new phone can result in the deactivation of the user’s existing phone. Done ahead of time, that can ruin the surprise. Best Buy’s Causey, though, says that hasn’t been a problem. He said customers contact the gift recipient with advice on how to reactivate their old phone and defeat a non-existent “bug” that shut it down—preserving the surprise of the Christmas morning gift.